This piece is in C major. The not-too-subtle arrows, however, are pointing out a chord (the same chord, thrice) which contains an Ab, patently not a card carrying member of the C major scale. The chord in question is a B diminished seventh chord (minus the third, a D) over a pedal note C. This fully diminished chord is the VII chord of the C harmonic minor scale. If we (or rather, Giuliani) had stuck only with the VII of C major we (he) would have had a B half-diminished chord. Both of these VII chords (can) resolve the same way: to the I chord. However -- and just from a bare bones technical point of view, minus any emotion or drama imparted to the music -- the fully diminished chord, because of the Ab, feels even more in need of resolving. So even though this chord is not part of C major, it still causes motion towards the C major triad. This happens fairly often with the IV chord. In a major key the IV (which is a major chord) is followed/replaced by the IV from the parallel harmonic minor, which IV chord is a minor triad. The first time I really remember hearing this kind of borrowing was in the Beatles' Across the Universe, where there is a Gmin to Dmaj. It pops out but leaves no doubt as to where it's going. On a related note is the Picardy Third (click here for the Wikipedia entry). This is a fairly old harmonic practice that uses a major triad instead of an expected minor one at the end of pieces, etc, in minor/modal keys. Today's post will be concerned with another caveat when considering keys. This one could also be called About Non-Chord Tones. All the notes highlighted in red are not part of the C major scale. This should be somewhat obvious, because C major contains no notes which are sharps or flats, and all of the highlighted notes are sharps and flats. But not only are they not not part of C major, they don't form part of a chord which is in another key, either. Consequently these sorts of notes are called (very creatively) non-chord tones. There are actually a fairly large slew of non-chord tones, but technically classifying them all isn't really important for our purposes here. The main thing to keep in mind is that all twelve tones of the chromatic scale can be in play without destabilizing the tonal center. This is good to know when improvising or writing melodies. There is a lonely note above highlighted in blue. Upon inspection can you see why it has been singled out as a different kind of chromatic note? It's because that Bb is part of the chord, the 7th of the C7 chord, which is the V7 of the key of F major, and low and behold F major is the next chord. Endnote "Caveat to a caveat"
In the Joplin tune the lonely D-sharps at the very end of the two lines could be considered as the #5 of a G augmented triad. In which case the D-sharp is in fact a part of a chord, but the chord it is a part of actually reinforces C major, and not another key area. More on this in a later post! So up to this point we've been analyzing keys by looking at the group(s) of notes that we've found in pieces of music and giving the group(s) a name, so far basically a major key name. There are two caveats we need to be aware of now, and in this post we're going to look at the first one of them. And this is true. From an improvisational standpoint you could take your C major scale and blow away over these chords and you would be on firm ground. BUT if we had to describe the key of this piece to someone it might seem strange to say that it's in the key of C major. Perhaps they ask well, shouldn't there be a C major chord in the key of C? This is commonly referred to as the A natural minor scale, and it is also known as A aeolian, The above progression is best seen as being in A minor because that is the most pronounced chord. The only difference from before is that E7 (and you could just go ahead and use plain ol' E maj) has a G# where E minor had a G natural. This, too, has a name: the A harmonic minor scale. The point of all of the foregoing is that simply identifying a group of notes is not really enough to determine a key: we really have to take into account the chords and see (actually hear) what the harmonic focal point is. and the result will never be that the progression sounds like A aeolian. It will sound in C major because of the chords. Well now we've got a strange situation: there are eight different notes here. All major scales (and minor scales, double harmonic, neapolitan, etc) contain only 7 different notes. If we are to assign this progression to a major key we'll have to get rid of one of these notes. How should we go about this? Let's look at the F, F#, G area. There are no major scales which contain this sequence of half steps, so we might be able to get rid of one of these notes. C D E F# G A B. So now if we're only examining the notes of the chord progression we're at somewhat of a stand off: is the key of the progression C major or G major? Or maybe it's both? Actually it is both, but just not at the same time. Let's look at the Fmaj and D7 chords. When we come to Fmaj it's safe to say that the note F# is not really being articulated; likewise when we reach D7 the F natural is not part of the chord (look at the notes of the chords above if this doesn't make sense). In other words when we have F in our chord progression we are in the key of C major, and when we have D7 we are in the key of G major. Notice something else here, too. The D7, as related to G, is V chord (that is the note D is the fifth note up in the key of G major). This is the only place that this happens in the major scale: there is only one dominant 7th chord, and it is built on the 5th scale degree. This is very good information to know, because when we encounter dom7 chords we can check to see if we are in a key where that dom7 chord is the V chord. When this is the case we say that the dominant seventh chord is functional, i.e. that it has a certain role that it is fulfilling, namely that of pronouncing the key. Not all dominant seventh chords are funtional! The blues progression is the most famous example of this, but actually this chord (and any chord) might just be used for the sonic atmosphere which it produces. These are cases where the dom7 chord is non-functional. Here G7 goes to Amin, the VI of C major, but it's still a part of functional harmony. And here's a way to hear how dominant 7th chords really push acoustically to a new key. This isn't really an academic exercise, either. All of these progressions are far from rare, and you're probably familiar with hearing them (with the exception of the last one). So the main point of this post is that not all progressions are in a single key; and sometimes when this happens dom7 chords can be a helpful signpost in helping us to determine the key(s). ENDNOTE: There are in fact eight note (octatonic) scales running around out there in the world, the most famous of which are bebop scales and the diminished scale. The reason they weren't considered above is because bebop and diminished scales aren't actual generators of harmonic progressions, they are scales which are used to play over existing harmonies (bebop dominant is used over dominant chords, for example, whereas the diminished scale can be used over diminished chords and dom7b9 chords). If you read part i of this series and found yourself thinking WTF??? have no despair: this post will (hopefully) be a bit more clear and get us nearer to understanding what a key is. A scale is a way of presenting the notes in a very clear manner. A key differs from a scale in that the notes can come in varying orders and combinations. Today's post kicks off a series on the nature of keys. I want to come at the question from a different angle: instead of defining what a key is first let's look at some music and try to describe what's going on melodically. In so doing perhaps we'll get a better understanding not only of what a key is but why they're very helpful descriptively. Here's a transcription of the beginning of a traditional Thai piece called Javanese Suite. To hear a great performance of this by the ensemble Fong Naam click here. 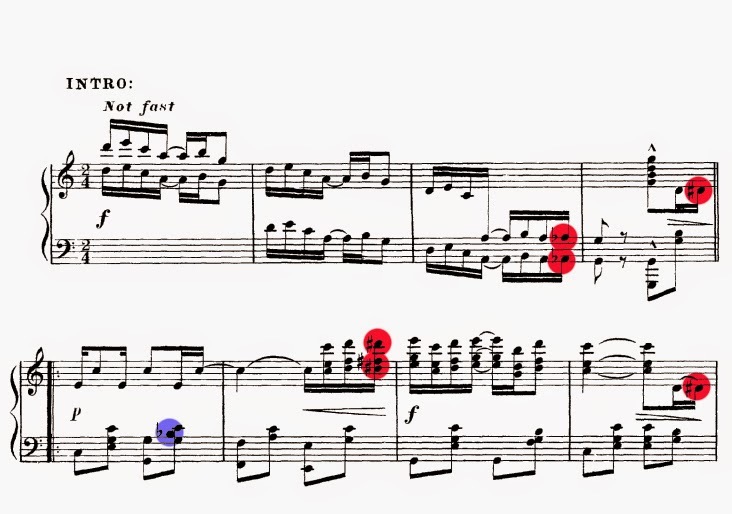 We can now see that the entire passage is made up of only five different notes: G, B flat, C, D, and F. If we jumped in and improvised to this tune (which we can do with the YouTube link above) we should be safe if we stick to these notes. And by safe I mean that we won't be adding any "colors" to the piece that aren't already present. So basically we can say that by knowing the notes that make up a piece we have a key to unlocking the door which might otherwise bar our entry. Knowing what a pentatonic scale is and how to play one on your instrument(s) in any key would be crucial if you were going to play other music like this. For instance try playing along to Zhou Xuan's performance of Song of the Four Seasons. If you sing or play the melody you'll soon discover that it's from the F sharp major pentatonic scale. And if you had to transpose the song for some reason (like for certain instruments' tuning, or for a singer, etc) doing so shouldn't be too complicated if you know the pentatonic scale. are both made up of the same group of notes. Knowing that they both are from the G minor pentatonic scale cuts down on what we have to categorize tremendously. See my post on permutations: it's obvious that we don't want to name every sequence of notes as they can become nearly infinite in number. Knowing the notes that make up a piece of music is the key that allows us to enter into the music more fully. And being able to determine what pattern (if any) the notes are in is extremely important as it's less that we have to memorize. This is why it's a good idea to learn many different kinds of scales: they allow us to categorize the music we encounter. And the more scales that we know the more able we'll be able to understand various styles of music. To be sure there are some complicating factors that arise (e.g. a lot of music isn't in one single key or sometimes it's ambiguous as to what the key actually is or sometimes the sets of notes used don't correspond to any scale) but fundamentally the process is always the same: discern the notes and see if they fall into pre-established patterns. The chord built on C gives us a C major triad, the chord built on D gives us a D minor triad, the one on E gives us E minor, F gives us F major, G gives us G major and A gives us A minor. Lastly the chord built up from B gives us a B diminished triad. So you might wonder, why the Roman numerals in the chart? These numerals are actually very helpful, because they give us a more general way to talk about the chords in any major scale/key. Since all major keys are built up from the same recipe (a sequence of WWHWWWH steps) all the chords built up from the individual degrees will likewise occur in a predictable pattern. Put more simply: In D major the chord built on the D (I) gives us a D major triad. In B flat major a chord built on Bb (the I) gives us a Bb major triad. In F sharp major the chord we get on C# is C# major, the V chord, just as we got a G major chord in C major. VII is a diminished triad. You know right away that the entire thing is NOT in one single key. Why? because there are FOUR DIFFERENT major chords, and in any given major key there are only three. we would be dealing with the I, IV and V of G major. Why is the above key not E major? If it were in E major the VII should be a D# diminished chord, but here we have D major, a bVII with respect to E major. Why is it not in the key of D? If the above were in D major the II chord should be E minor, but here we have E major. Are all of the above chords found in the key of A major? YES! E major is the V chord, D major is the IV and A is the I. For some more practice check out the following post.